(01-30-2019, 07:42 AM)TheLegalRazor Wrote: zipper raises a good point. Shipping it anywhere is a risk. You can send Bernd pictures and whatever measurements he requests. He can do the knot and ship it to you. Installing the knot is easy. I have written to Berndt at Shavemac to organise him getting a knot down to me here in Sydney. No reply yet. I think maybe a week? He might be really busy. I hear good reports, but that he sometimes has email/server issues. I believe you would need extremely resilient hair to retain sufficient backbone at 17/18mm x 50mm. Bulb shape would help but maybe not sufficiently if the hair is very soft & flexible. The old Rooney Finest or Plisson HMW hair was of this type and so can be found with high lofts. If the high loft is important you may want to go with Shavemac's D01 2-band which is some thick resilient hair. But it is their most expensive and some have reported a bit a scritch. I've only tried two such knots and they had very strong backbone but no scritch. If these factors/risks are not an issue for you the D01 2-band at 17/18mm x 50mm bulb could work nicely. (01-31-2019, 06:18 AM)shevek Wrote: I believe you would need extremely resilient hair to retain sufficient backbone at 17/18mm x 50mm. Bulb shape would help but maybe not sufficiently if the hair is very soft & flexible. The old Rooney Finest or Plisson HMW hair was of this type and so can be found with high lofts. If the high loft is important you may want to go with Shavemac's D01 2-band which is some thick resilient hair. But it is their most expensive and some have reported a bit a scritch. I've only tried two such knots and they had very strong backbone but no scritch. If these factors/risks are not an issue for you the D01 2-band at 17/18mm x 50mm bulb could work nicely. Scritch is no problem for me. In fact, sometimes I like it, Rob. I have quite a few brushes that are already extremely soft, and while it's nice, I don't think, for me at least, it's the ultimate aim or benchmark in assessing a brush's value, worth or quality. Sometimes I like to drive a manual car, too, if you catch what I'm saying. Because I spent so little on the handle, I'd gladly pay more for a decent loft. My only issue is its insertion. I've yet to hear back from Berndt. I’ve had the same problem Shaun. I’ve tried twice contacting with not hearing back for a month now. Highly unusual. (01-31-2019, 01:25 PM)kooshman7 Wrote: I’ve had the same problem Shaun. I’ve tried twice contacting with not hearing back for a month now. Highly unusual. Just received his reply. All good. He advises a Silvertip 2-band (he'll make the knot) which is not quite as stiff as the D01, but firm enough. Just awaiting price plus shipping. That’s good. I’ve heard nothing so far. I found this image on an internet search, trying to date the brush. It is from an 1888 Koch's catalogue. It is not exactly the brush, but in terms of style, approximates it reasonably closely. It is the No. 51 brush, second from the top, in badger and bone ($6 per dozen!!!). 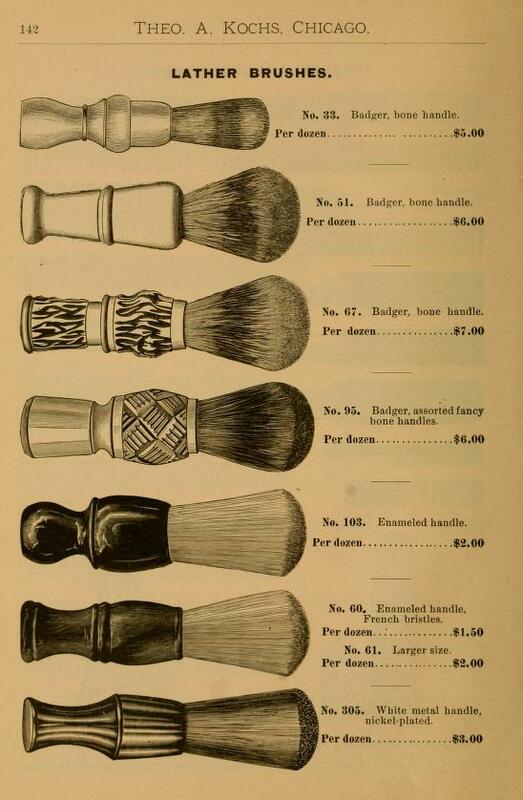 I'm thinking yes, my brush may indeed be from this period. I doubt I shall ever find out who the French maker was, or the exact date, so it will always be a case of speculation until, perhaps by chance, some new evidence comes to light. Congratulations on an amazing find! Museum piece if only the knot was in better shape. (02-12-2019, 09:02 AM)tubular Wrote: Museum piece if only the knot was in better shape. Possibly, yes, if there were a museum having even the slightest interest. Either way, it'll stay in my personal museum and will be re-lofted. Just waiting for a new Shavemac knot to be made and sent. Unsure how long that will take, but I'm in no particular hurry. 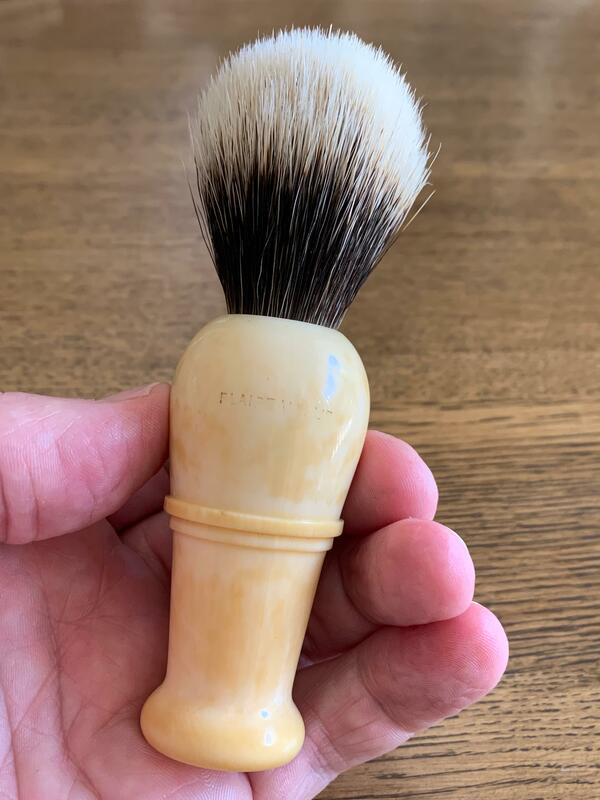 This is the beautiful brush, now with the Shavemac knot (Silvertip 2-band) using silicon sealant so the knot can be removed if required. The knot is inserted a little more deeply than normal, resulting in a loft height of 47mm. The knot is 18mm. being slightly shorter, the bristles are firm but soft tipped. Nice. I'm sure you'll all agree that the result is wonderful. I am waiting for the sealant to set and cure (72 hours) before I even consider lathering up. The blue on the handle is a reflection of the sunny Australian sky. Outstanding work by Bernd. That is a truly special piece. (02-25-2019, 05:18 PM)churchilllafemme Wrote: That looks great, Shaun. Yes, thanks John. Indeed it does. I was a little worried about the scale and proportions, etc... aesthetics, but it works. In real life, it looks even better. A photo can't capture the scale properly, but it is as close to perfect (to my eye, anyway) as possible. The overall height is 117mm. 47mm loft. Knot just very slightly over 18mm. 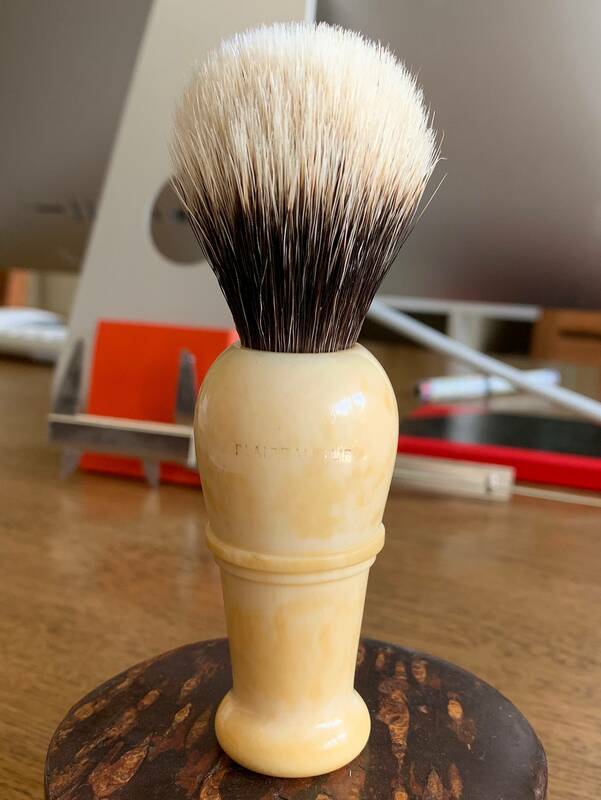 Overall the aesthetics present a beautiful brush. Shaun, your knot looks promising and look forward to you thoughts after use.